The versatile Colella was a three-time Little All-American in college and the Detroit Lions chose him in the fifth round of the 1942 NFL draft. Following two seasons as a tailback in Detroit, he was traded to the Cleveland Rams and was a member of the 1945 NFL Championship team, having been shifted to halfback in the T-formation offense while still performing in the defensive backfield and punting. Rather than move with the Rams to Los Angeles, Colella jumped to the Browns of the new AAFC for 1946. Browns went 12-2 to finish first in the AAFC Western Division while leading the league in interceptions (41), fewest passing yards allowed (1317), fewest touchdowns allowed (19), and fewest points allowed (137). Won AAFC Championship over New York Yankees (14-9). Colella again led the AAFC with six interceptions in 1947, one of which he returned for a touchdown. 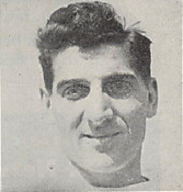 After one more season with Cleveland, Colella was traded to the Buffalo Bills in 1949, which was his last season. Overall, he intercepted 26 passes, five in the NFL and 21 in the AAFC, with 18 of those coming with the Browns. He also averaged 37.4 yards on 197 punts, with 97 of those kicks averaging 37.6 yards with Cleveland. 507 of his 753 rushing yards came in the NFL, as did 10 of 18 pass receptions. Colella was a charter member of the Canisius College Athletics Hall of Fame and was later inducted into the Greater Buffalo Sports Hall of Fame.